McGill University’s Visual Arts Collection is home to hundreds of painted portraits, many of them picturing famous McGillians who, in one way or another, left their mark on the University. Displayed across the downtown and Macdonald campuses (Fig.1), these portraits function like a living history of the University, and, often, of Montreal and Canada, too. They are also important art historical documents. One portrait in the Collection –of one Duncan A. McCaskill (Fig. 2) –was long appreciated for its artistic pedigree, but little was known, until last year, about its subject and connection to McGill. 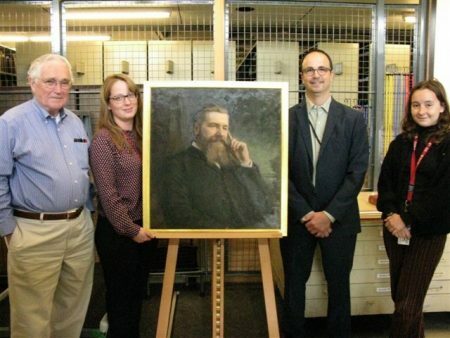 In September 2018, a well-placed phone call to the Visual Arts Collection by Dr. Newton Hyslop of Massachusetts set our discovery in motion. Fig. 1: Portraits from the Visual Arts Collection on display in Redpath Hall, McGill University. Fig. 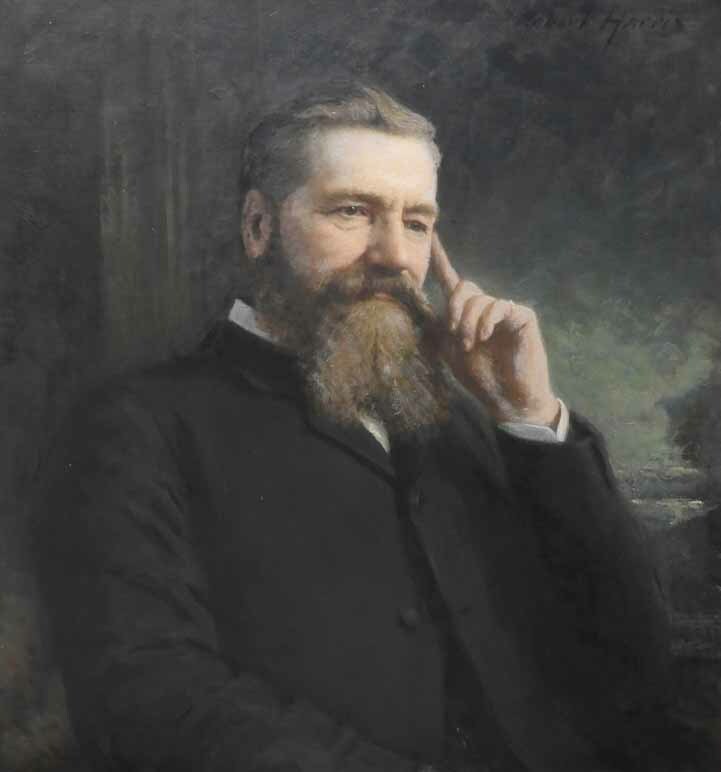 2: Robert Harris (1849-1919), Portrait of Duncan A. McCaskill, oil on canvas. Visual Arts Collection, McGill University Library 1973-094. Robert Harris (1849-1919), the portrait’s painter, was one of the most notable portrait artists in Canada during the 19th century. Originally from Wales, Harris immigrated to Canada as a child, going on to train as a painter here, in the United States, and in Europe. He became famous when, in the early 1880s, he was awarded the commission for The Fathers of Confederation (1883), a large-scale painting that combined the genres of portraiture and history painting to show the 1864 Conference at Québec. Hung in Parliament, but long since destroyed, The Fathers established Harris as the go-to portraitist for Canada’s political and economic elite. His subjects included John A. Macdonald, William Dawson, John Henry Molson, Peter Redpath, and many more. Several of these other Harris portraits are also in McGill’s Visual Arts Collection. So, who was Duncan A. McCaskill? If Robert Harris was commissioned to paint his portrait, we could be sure he was a figure of substantial historical significance. For many years though, even his name eluded us. When the National Gallery of Canada, Ottawa, mounted a major retrospective on Harris in the 1970s, the Visual Arts Collection was asked to loan several of its Harris paintings. The portrait of McCaskill was specifically requested. In fact, the painting, then on display in Purvis Hall, was described in letters to and from the National Gallery as “the best Harris on campus.” The name of the sitter, though, was unknown. 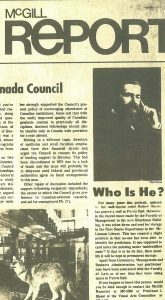 Ahead of the exhibition, on October 25, 1972, McGill put out a call for identification in the McGill Reporter (Fig. 3). The call was answered by Edgar A. Collard of the Montreal Gazette who recognized Duncan A. McCaskill from the third volume of William Henry Atherton’s comprehensive history, Montreal, 1535-1914, published in 1914. It not only became clear who McCaskill was, but also that Harris’ portrait of him was likely painted posthumously, based on the very photograph included in Atherton’s book (Fig. 4). Duncan Alexander McCaskill was born in 1840 in Little Narrows, Victoria County, Nova Scotia. When his brother, Donald McCaskill, died at the young age of 52, Duncan left Nova Scotia in search of fortune in Montreal, with the goal of sending money back home to support his family, including Donald’s children. He came to prominence in Montreal after founding D.A. McCaskill, Dougall & Company, a manufacturer of railway and carriage varnishes. 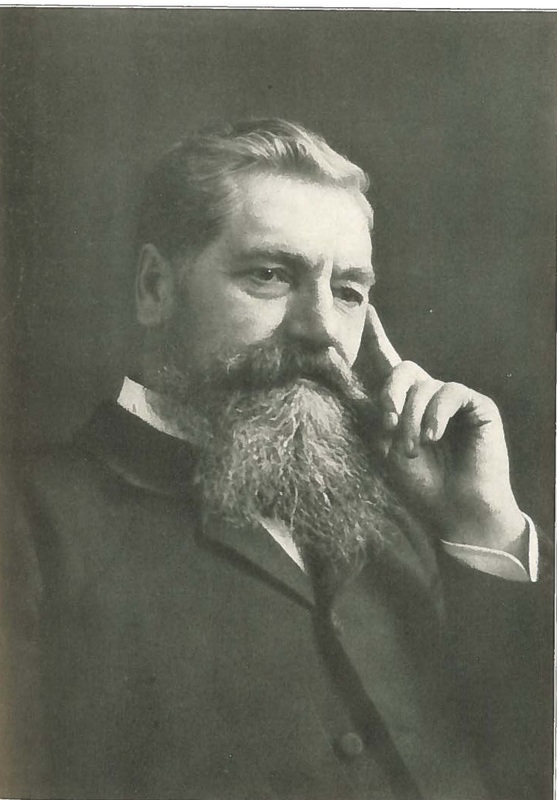 Hugely successful, he earned the title of one of Montreal’s prominent fin-de-siècle industrialists. He died in 1907, and was buried at Mount Royal Cemetery, where his wife, Seba Lillian Abbott Smith (McCaskill), was also later buried. Why and how, though, did Harris’ portrait of McCaskill end up at McGill? Fig. 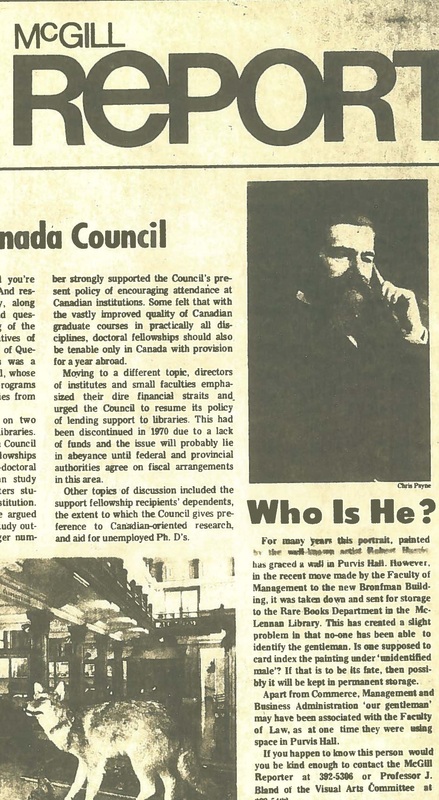 3: An excerpt from the McGill Reporter, Vol. 5, No. 6 (October 25, 1972). When Dr. Hyslop called the Collection, inquiring about a portrait of his great-great uncle by Robert Harris that he had been told was at McGill, he barely had to speak McCaskill’s name; we knew this was the portrait he was after. Dr. Hyslop, who was headed to Montreal to visit the gravesites of his great-great aunt Seba and great-great uncle Duncan, asked to visit the portrait, too. Joined by Yves Lapointe, Director of the University’s Archives, we met with Dr. Hyslop, who was thrilled to be reunited with great-great uncle Duncan (Fig. 5). As he showed us his carefully digitized family archive, we learned from Dr. Hyslop that the portrait came to us in 1947, when it was offered as a gift through Jessie Helen McCaskill, Duncan niece, and one of three daughters of Donald McCaskill. Thanks to her uncle Duncan’s sponsorship from Montreal, Helen and her sisters had been able to attend and graduate from Dunham Ladies College in Quebec. Helen, who later went on to have a successful career as a nursing director in Massachusetts, spent many years in Montreal as companion to her widowed aunt Seba. When settling her aunt’s estate in 1947, Helen also arranged for a bequest left by Seba to be used toward the establishment of two scholarships at McGill: one in Seba’s name, and one in Duncan’s name. Fig. 4: Photograph of Duncan A. McCaskill in William Henry Atherton’s Montreal, 1535-1914, Vol. 3 (Montreal: S.J. Clarke Publishing Company, 1914), 481. Seba, who lived and taught in Montreal long after Duncan’s passing, died in 1947 at age 93, leaving funds for scholarships to support incoming students, in some cases from Nova Scotia (Duncan’s home province), who show academic promise and financial need. The two scholarships (the Duncan McCaskill Scholarship and the Seba Abbott Smith Memorial Scholarship) are still active today. We are so grateful to Dr. Hyslop for his visit. This family reunion elucidated a great deal about an important work in our Collection, which had long been steeped in mystery. In conversation with Dr. Hyslop, we learned all about Seba and Duncan (as we now refer to them, with some familiarity), and the life they lived together here in Montreal. Visits like Dr. Hyslop’s help connect us, and our artworks, to a deeper history. They also serve as an important reminder of the importance of communal research and knowledge-sharing, and of the symbiotic relationship that libraries, archives, and art collections share with their users and community members. In this case, Dr. Hyslop’s visit also brought into focus the human experiences behind two scholarships that have helped McGill students achieve success for over 70 years. It is heartening to think that Seba and Duncan, whose ventures in Montreal helped support their family’s education, continue in this way to support the education of others. If you have a question about an artwork in the Visual Arts Collection, or would like to visit us, do not hesitate to get in touch. We may learn just as much about our Collection as you do! Fig. 5: Standing with the Portrait of Duncan A. McCaskill are, from left to right, Dr. Newton Hyslop, Vanessa Di Francesco (Assistant Curator, Visual Arts Collection), Yves A. Lapointe, (Director, McGill University Archives), and Rosalind Sweeney-McCabe, (Museum Database Intern, Visual Arts Collection). September 2018.